The best way I learn things is by teach it and doing it. 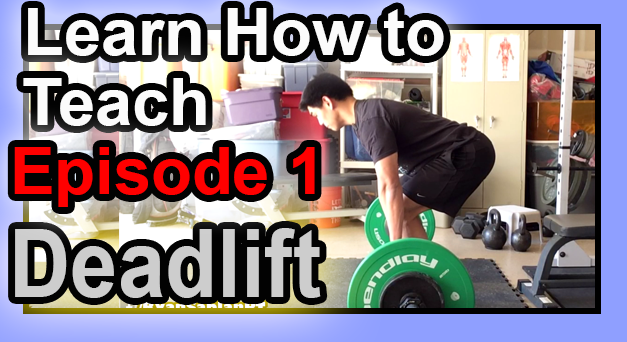 So I made this video to help you teach the deadlift, so you can deadlift better. Deadlift and bent over row have always been the most difficult exercises to teach someone. This is because most people lack motor control in the hips, hamstring and low back. I think most people are really afraid of the deadlift because people get paranoid about hurting their back. I use have to low back problems and suffered from sciatica on off – so when I first started deadlifting I was tentative and conservative. To make a long story short, I can now pull 500lbs with confidence off the ground. Since building the strength to do that, I now seldom suffer from any back problems or even back tightness. I still get hip tightness, but low back problems are now non-existent since I built the strength to deadlift 500 pounds. I even did my powerlifting meet. I’ve come to the conclusion that reason why I had so back problems was because I was weak. Me, personal trainer of 10+ years was weak. Looking back in hindsight, I was inflexible and weak. Now I’m more flexible and strong.